JKT International, a family run business that has gone from strength to strength operating locally, nationally and internationally since the business was first established 50 years ago. At JKT International, we pride ourselves for our exceptional standard of service. We aim to carter for every need of all our customers in a professional and effective manner. 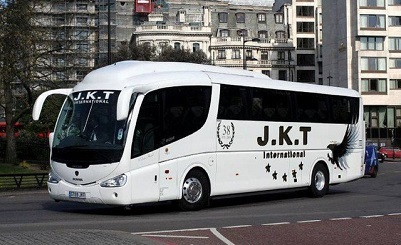 JKT International is a leading Coach Company based in Walsall. Whether you are looking to hire a coach for your business or for group travel for Schools, Clubs or Societies, We are the company for you! JKT International coaches include a range of facilities and luxurious comforts. Our fleet of vehicles consist from 16 to 70 seaters. All Of Our Vehicles are kept clean and very well maintained. GET IN TOUCH, GET A QUOTE!